As a television reporter you will have an exciting job reporting local or national news. You may be covering a political convention one day,interviewing a celebrity the next, and reporting on breaking news after that. Not only are you among the first to know about major local and world events, you often get to witness them in person. The people you meet will range from the very ordinary to very famous. 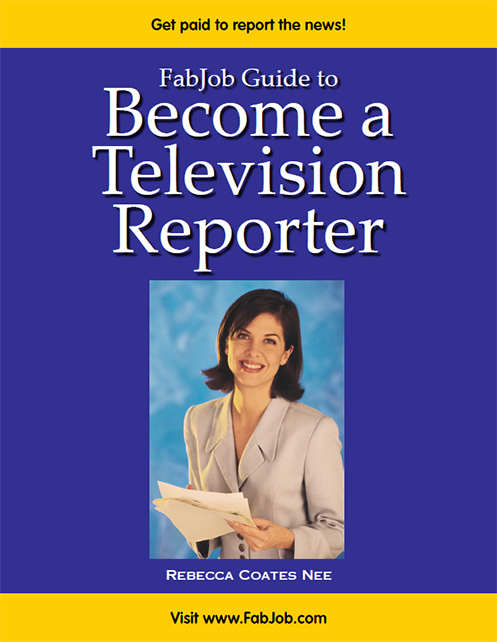 In the FabJob Guide to Become a Television Reporter you will discover how you can get started and succeed in this exciting career. There is a lot of competition for television reporting jobs. But you can greatly improve your chances of getting hired as a television reporter by approaching stations the right way. You can get the competitive edge with this guide. Author Rebecca Coates Nee is a professional career coach specializing in broadcast news. A television anchor and reporter for 12 years, Rebecca taught journalism at California State University. In this guide she shares her own experiences as well as insider tips and career advice from other successful television reporters. You can have all this and more for an incredible special price. People pay up to $90 per hour for coaching on how to break into television reporting. This guide includes some of the best advice you could get from other sources and more. The information in this guide can save you many hours of research, help you avoid some costly mistakes, and give you information you need to start getting paid as a television reporter. This guide has been selling for up to $39.95 U.S. for an e-book alone. SPECIAL OFFER: If you buy the e-book today, you can have this valuable insider information for the incredible price of only $19.97. You can earn back the price of the guide many times over your first day on the job. If you believe you deserve to have the career of your dreams, this guide is for you. It gives you what you need to know to get a job as a television reporter. Don't miss the opportunity to have the career of your dreams. If you are undecided, take advantage of our guarantee. Buy it, read it, and if you are not satisfied, your money will be refunded. Ordering is fast, easy and safe. You will receive your e-book within minutes. Click the DOWNLOAD NOW button below to order your guide now. We are so confident this FabJob e-book can help you achieve your dreams, we will give you a full refund if you tell us within 60 days that you are not happy with your purchase. Simply email fabcare@fabjob.com and we will refund your money, no questions asked. Click the “DOWNLOAD NOW” button to get your guide now.